The top-down fire works well for masonry ovens, stoves, and fireplaces, as well as outdoor fires. It’s simple: dry fuel, small sticks (plenty of surface area), plenty of volume where fuel and oxygen can mix — and kindling on top, so the fire burns down, clean and hot. Think of a candle: the flame on top pre-heats the fuel (wax) below, as well as the incoming combustion air. The wick burns hot, bright, and clean, so all you get is light and heat — a perfect fire! If you use it in your oven, your neighbors won’t have to breathe your smoke for hours while they’re waiting for the invite to the pizza party. Fire is what truly distinguishes humans from all the other species — not our brain, our music, or any of our wonderful “achievements.” The one thing we do that none of the other animals do is to make and use fire. Only humans rely on external fire for our survival… All the others keep their fires inside. The video shares pix, processes, and some tips on fuel prep. It’s also worth looking at the technical articles on the Masonry Heater Association website. good to see your video on building up a fire in the oven. 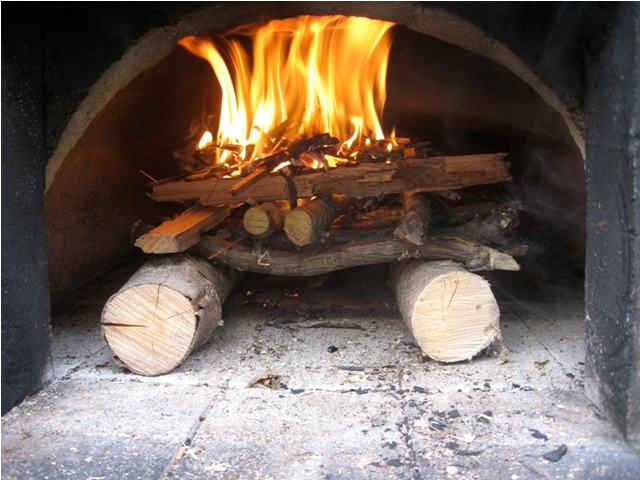 I am wondering if you have ever used charcoal to keep a fire going when making pizza. I have been given some locally made charcoal and thought it may be worth having a go. Have you any thoughts on this? Hi, Bex, good to hear from you. What you need for pizza is a live flame. Charcoal was traditionally made for burning in a forge with a bellows, or in a kiln. With the kind of strong draft you get in a forge or kiln, it provides much higher temperatures than regular wood fire. It generally burns much cleaner than wood, so it was also traditionally used for indoor cooking and heating fires. Until coal production got big, charcoal fueled the beginnings of the industrial revolution — as such it was, and still is, a major contributor to deforestation, as well as to good management practices like coppicing. The ovens themselves produce some charcoal, but what I do with that now is grind it up and add it to the compost, where it improves fertility and sequesters carbon (for more about that, see this post on Terra Preta and The Biochar Solution: http://www.handprintpress.com/authors/terra-preta-and-the-biochar-solution/). Best winter wishes from chilly Oregon! Awesome hat. I want one = ) I also want a firing door, so thanks for this helpful video.